Enter the world of literature and feel inspired. The Hotel de las Letras emerged from a renovation project, by the architect Virginia Figueras, of a 1917 building situated on the emblematic Gran Via of the Spanish capital and acknowledged as Madrid historical heritage. Completely refurbished, the hotel pays homage to the worlds of art, culture and literature. Reflecting this, the library and reading room for guests, as well as the interior design of the rooms, all of which face the avenues, combine quotations from famous authors with attractive state of the art design. At the hotel one may still have the pleasure of appreciating a fascinating collection of unique antique tiles, carpentry and balconies perfectly woven into the bold and innovative interior design. The hotel’s restaurant, directly and independently accessible, presents itself as a cornerstone to the hotel, offering a youthful and comfortable ambiance that believes in the fusion between leisure, culture and gastronomy that originates glamorous gastronomy. When in the heart of Madrid, don’t miss the opportunity to wander through the city, visiting its renowned museums, monuments and palaces during the day. During the evening there is a variety of bars, restaurants and clubs to guarantee an amazing night out. 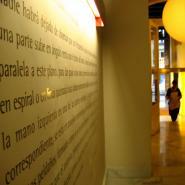 The Hotel de las Letras is situated in the centre of Marid, 6 km from Barajas – Madrid Airport. From Barajas – Madrid Airport, take the A10 highway towards the centre, to Paseo de la Castellana. Continue on Paseo de la Castellana, until Plaza de las Cibeles. Once there turn to the right, entering Calle Gran Via. The hotel is just a few metres to the left.